Dose deposition to a medium may only be directly measured by the method of calorimetry. However, this is not what we do in practice. What is usually done is that we use an ionization chamber of some kind to measure exposure and then apply a series of correction factors in order to derive dose values corresponding to the measured exposure. 1 roentgen = 0.00873 J/kg = 0.00873 Gy (Note that this equation turns exposure to dose to the air in the chamber. Also note that 1 J/kg = 1 Gy). In order to get more information about the relationship between absorbed dose and exposure please refer to the book: The Physics of Radiology, Fourth Edition. Harold Elford Johns, John Robert Cunningham. See paragraph 7.07. Some ionization-chamber-based dosimetry systems may be set to return dose values to the user. In such a case the above procedure is already built-in to the system. From the above discussion it must be clear why we usually refer to dose measured in air when an ionization chamber is used. If we want to calculate the dose deposition to a material other than air. We need to use another set of coefficients. These coefficients are derived through the “cavity theory”. In fact what we do here is convert the dose to the air (calculated in the previous step through measured exposure) in dose to the medium in question. is the well-known mass–energy absorption coefficient ratio”. Here the mass-energy absorption coefficients have been averaged over the photon fluence spectra. Depending on the spectrum of the photon beam and the medium where dose needs to be calculated the coefficients μen/ρ of materials and their ratios are different. Such coefficients may be found in textbooks such as the “Physics of Radiology” mentioned above. An online version of them is provided by the US National Institute of Standards and Technology (NIST) http://physics.nist.gov/PhysRefData/XrayMassCoef/tab4.html. The tables provided by NIST tabulate the coefficients for different photon energies. Remember that it is imperative to find the correct set of coefficients corresponding to the right spectrum and then calculate their ratio. This could be a little difficult for x-ray beams in radiology since the spectrum is not monoenergetic. 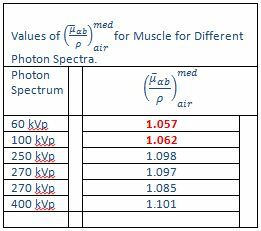 Muscle/air mass-energy absorption ratios for different x-ray spectra. The factor will be different for different materials. Also filtration changes the spectrum of the beam and could introduce difficulties in selecting the correct ratio. The above example proves that caution is needed to make sure a comprehensive set of coefficients and equations is selected. E.B. Podgorsak, Technical Editor. Radiation Oncology Physics: A Handbook for Teachers and Students. International Atomic Energy Agency (IAEA), Vienna, Austria, 2005. C-M Ma and J P Seuntjens. Mass-energy absorption coefficient and backscatter factor ratios for kilovoltage x-ray beams. Phys. Med. Biol 1999;44:131-143. *Air kerma and its differences from dose is not discussed in this post. The interested reader may digg deeper into the concepts involved in dosimetry and their implications (or maybe complications) by reading through 5th-7th chapter of “The Physics of Radiology” textbook.